Today was our most extreme day of driving yet, we drove solidly from 6am - 6:30pm with only 3 pee-stops - we didn't even stop for lunch as we made packed sandwiches this morning before we left! Again I'm thankful for motion sickness pills :) And luckily the drive was made bearable by card games and a simple version of Pictionary. Managed to see the vague outline of 3 of the volcanoes that lie on the Uganda, DRC & Rwanda borders during our drive. Yay, tomorrow we're off to see the Mountain Gorillas. 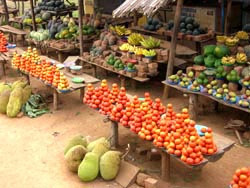 The picture is of the Ugandan Vegetable Markets on the sides of the road - I love how all the goodies are stacked, the pyramids of tomatoes! Interesting story. I have enjoyed reading your blog or a while. Glad you're enjoying it :) Always nice to find I have new unknown readers. Sounds and looks great! Weren't you just a little tempted to try a little ten pin bowling with those veggie displays?